Boodle-ding! You’ve got mail! Yes, you do, AOL Man, and I bet those messages coming straight from 1996 are awesome. Like, totally awesome. Ima check my Pets.com order, OK? AOL Man was rocking his email with his laptop speakers loud enough that we could all hear the old school “You’ve got mail!” proclamation. 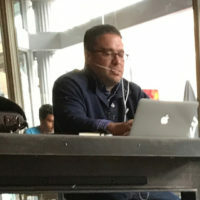 At first I thought he was being clever and using the sound clip to show off his clever old-school ways, but it turns out he was really checking his AOL email. Really. 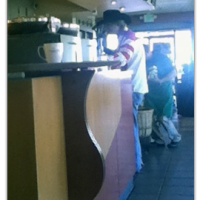 Of course, I snapped a photo on my iPhone, even thought I was afraid it might start devolving into a StarTAC as I was sucked into his time vortex and pulled back to 1996. 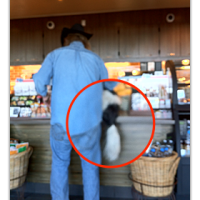 I quickly shared the pic on Twitter in hopes of getting the proof out to the world before WiFi ceased to exist. And you, my wonderful Twitter followers, started pointing out the things I didn’t. 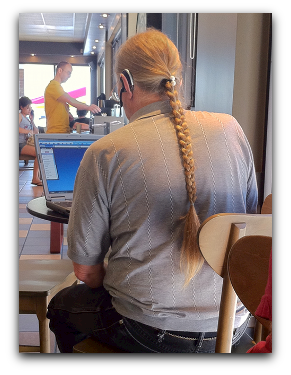 Like the beaded elastic bands in his braid, and the Borg-like Bluetooth earpiece grafted to his head. 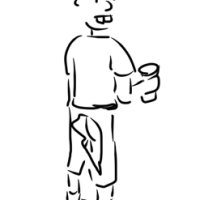 Turns out he also had a flip phone in a belt holster, just like all the 90s hip dudes. 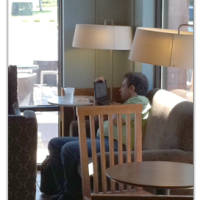 He was also complaining on his phone about how long it was taking to download a file in his email. Wait. AOL email supports attachments?